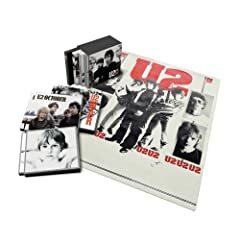 This week, Amazon releases an exclusive 6-CD box set of the three U2 remastered albums (with bonus discs) released last week, Boy, October, and War. Among a weekly release list filled with vinyl reissues, the only other new albums I have heard and can strongly recommend are Neil Halstead's (of Mojave 3) solo album, Oh! Mighty Engine and Wild Sweet Orange's We Have Cause to Be Uneasy. Sonic Youth's SYR8: Andre Sider At Sonic Youth presents the band's 2005 Roskilde Festival performance with Mats Gustafsson and Merzbow. Other than the U2 remastered box set, the vinyl reissues dominate this week's release list. The double album edition of Wilco's Yankee Hotel Foxtrot, which includes a copy of the album on CD, is definitely worth picking up if you don't have the album already.